Should Food Intake Be Measured In Exercise, Rather Than In Calories? If you knew you would have to jog for three times as long to burn off your meal if you ordered a burger instead of a salad, would it affect your choice? According to some new research, letting people know how much exercise is required to work off a meal is more effective than simply listing calories. The research, published in the American Journal of Public Health, started in four inner-city neighborhood stores. Researchers taped signs on the drink coolers that said it would take 50 minutes of jogging in order to burn off one soda, and during that time, the sale of sugary beverages dropped by 50%. This worked better than a sign simply stating the number of calories, and even a sign stating that one soda accounts for as much as 11% of daily recommended calorie intake. The study leader was Sara Bleich, assistant professor of health policy at the Johns Hopkins Bloomberg School of Public Health, who admits she was skeptical that the study would work. The target audience for this particular study was low-income African-American teenagers in four different Baltimore neighborhoods. A grad student stood in the corner of each store, quietly writing down the purchase of each teenager. 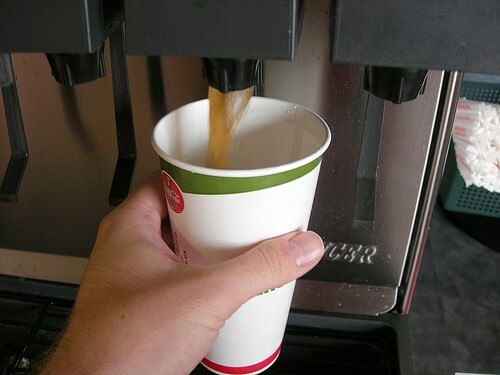 The signs with the percentage of daily caloric intake reduced sugary drink purchased by about 40%, and a sign simply stating the calories didn’t seem to have any effect. Many teens who saw the signs about the amount of exercise needed chose a bottle of water instead. Bleich chose this location and demographic because beverage companies tend to target black and Hispanic kids more than others. Between 2008 and 2010, soda ads for these demographics doubled. She is also exploring why the mention of jogging worked so well. Many people see prolonged periods of jogging and running as much less appealing than activities like sports or dancing, so that could have a lot to do with it. Do you think highly visible information like this would affect your food and beverage choices? If it worked for young kids who tend to care more about having fun and eating what tastes good, it seems likely that it would work on adults, too.